Does it make me a bad food blogger if THE food holiday of the year has totally snuck up on me? I know I should have had my recipe ideas written down months ago but the truth is, I’ve spent exactly 5 minutes this past year thinking about our Thanksgiving menu. We’re heading up to Wisconsin next week and I’m actually kinda/very excited that we aren’t hosting anyone this year. I’m in total chill mode, ready to contribute a few of the sides but not interested in stressing over how many rolls I need to make and seating arrangements. 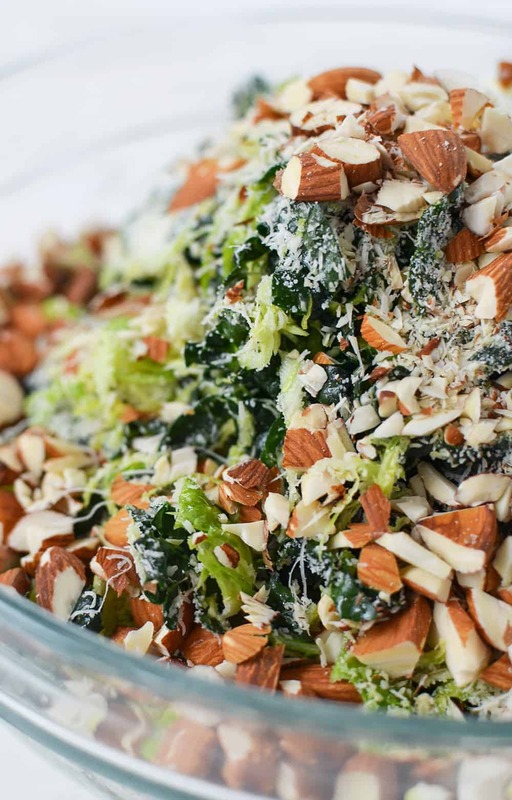 Perhaps that’s why I’m sharing this lazy guest salad: shredded brussels, shredded kale, toasted almonds, parm, and a lemon-dijon dressing. It’s so easy, you’ll almost feel like you got out of bringing anything when you show up with this. Prep a few ingredients ahead of time, bring a mason jar of dressing, and watch your family profess their undying love for brussels and kale. Or at least, that’s how it looks in my dreams. For real though. This salad, basic as it may be, is total flavor and texture overload. Chopped, toasted almonds stand in for both croutons and bacon. They give a salty, crunchy bite that pairs perfectly with the thin, wispy strands of brussels sprouts leaves. Resist the urge to buy prepackaged shredded brussels as they won’t be fine enough. I use my food processor to shred the sprouts in 20 seconds flat. Use a mandolin if you’ve got it. Paper thin, you almost forget you are eating mini cabbages. Since finely chopping things is a winning approach for anyone who dislikes vegetables, I’m using the same approach with the kale leaves. Remove the tough stems and stack the leaves on top of each other. Tightly roll, like a cigar, and then slice into beautiful kale ribbons. Toss everything together, add the salty, umami toppings and citrus dressing and you’ve got a salad that everyone will be asking for year after year. If you plan on bringing this one, prep it ahead of time. 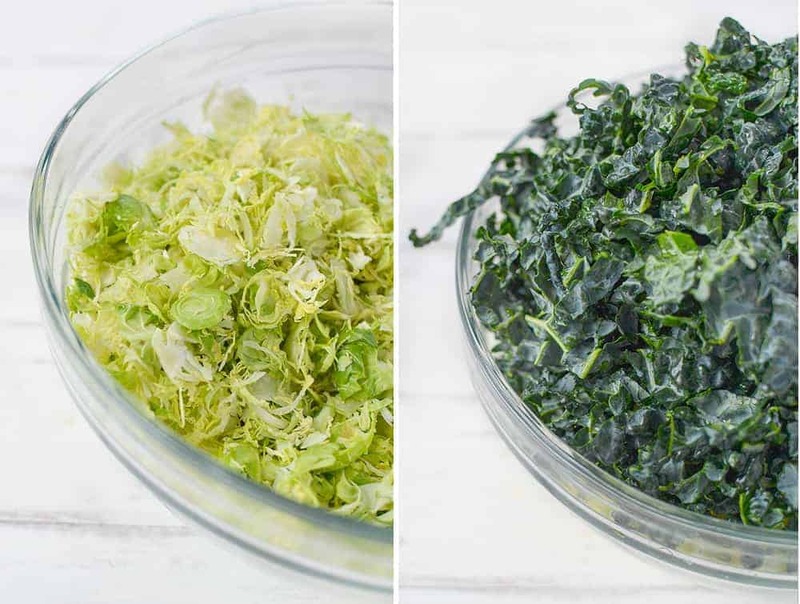 Shred the brussels and the kale and place in a large bowl. Bring a container of the almonds and cheese and a mason jar full of dressing. Just before serving, toss with the dressing and garnish with nuts and parmesan. Serve, give thanks, and enjoy all the praise that’s sure to come your way. 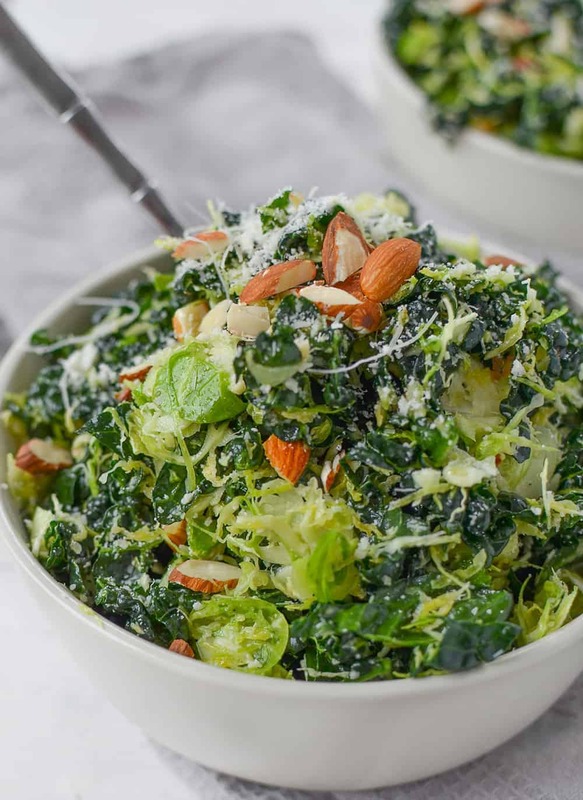 Shredded Brussels Sprouts Salad with Kale, Toasted Almonds and Grated Parmesan. The BEST salad, perfect for Thanksgiving and the holidays! Remove the stem and finely shred the Brussels Sprouts. I use my mandolin or food processor to shred them really finely. Remove the stems from the kale leaves and stack. Tightly roll into a large pile, starting at the end, finely shred the kale leaves so they look like ribbons. Place the kale and brussels sprouts in a large bowl. Whisk together the lemon juice, apple cider vinegar, minced garlic clove and dijon mustard. Combine until the mustard is dissolved in the liquid. Slowly whisk the olive oil into the lemon/dijon mixture. Season with a generous pinch of salt and pepper. 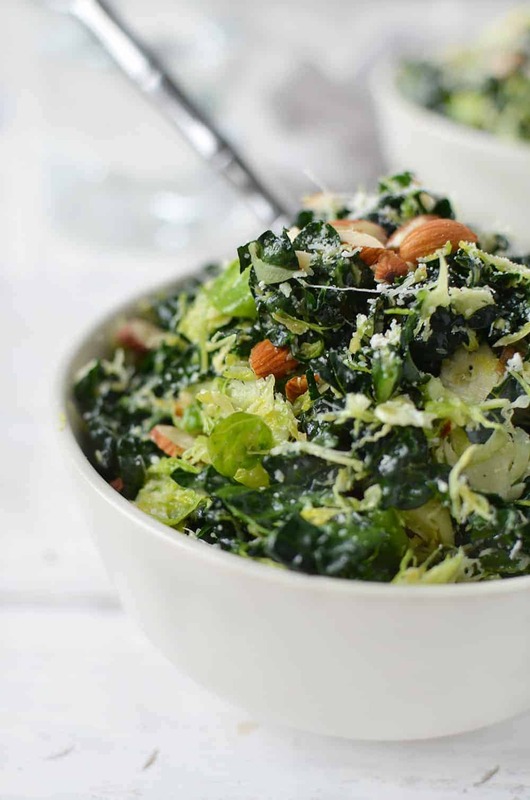 Add the dressing to the kale/brussels sprouts bowl and toss for ~3-4 minutes until the kale and brussels sprouts are wilted. Gently toss in the chopped almonds and parmesan cheese. Season to taste with salt and pepper, if needed. I’ve never thought about shreadding brussels in a food processor..genius! This is such a pretty dish, I think it HAS to be a side at Thanksgiving this year 🙂 Thanks for sharing! It’s SO easy! I forget that the food processor has a shredding/slicing blade, but it made salad prep for this salad incredibly easy. I’m not kidding when I say it took all of 20 seconds to shred all of them! I’m not a big fan of kale, but recently we’ve been loving the Trader Joe’s kale and broccoli slaw, so now I’m all excited about salads like this. 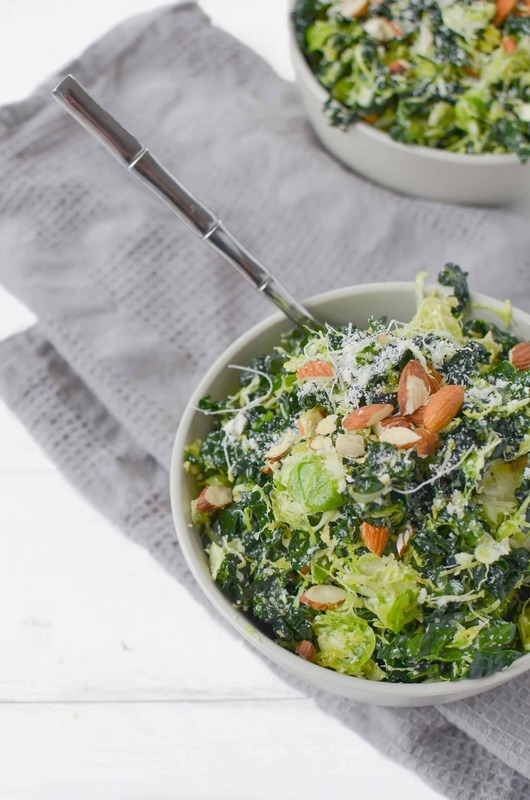 Your pics are amazing – the almonds and parmesan add just enough contrast to the greens. Oh, and I’m totally with you on this holiday creeping up…thankfully I’m not hosting this year either!! I love that salad! It’s such an easy side dish, TJ’s is the best! Does it make me a bad dietitian if I’ve never cooked brussel sprouts? Oh wait, there was that one time in Nutr 205 Food Prep- does that count? I love this idea. I’m super into salad textures lately so perhaps this will be my coming down from vacation mode meal! With the amount of goat cheese I plan on eating, it’s certain I will need a month worth of salads like these to whip up! I am definitely not on the ball this year with Thanksgiving. I’m winging it and will figure it out next week 😉 This salad looks AMAZING and I want to eat it every day!! YUM! my mom has made a salad just like this & it’s turned brussels sprouts haters into believers! This salad looks delicious. And I’m right there with you–I have no idea what I’m making/taking to Thanksgiving next week! What a great idea!! I’m usually so boring with brussels – I always just roast them. I have a bundle in the fridge that need to be used stat and now I have something fun to do with them! Wow, this looks amazing! I’ve never eaten brussels sprouts raw before so I’m definitely going to have to give this a try. Thanks for the tip on throwing them in the food processor too! So easy!